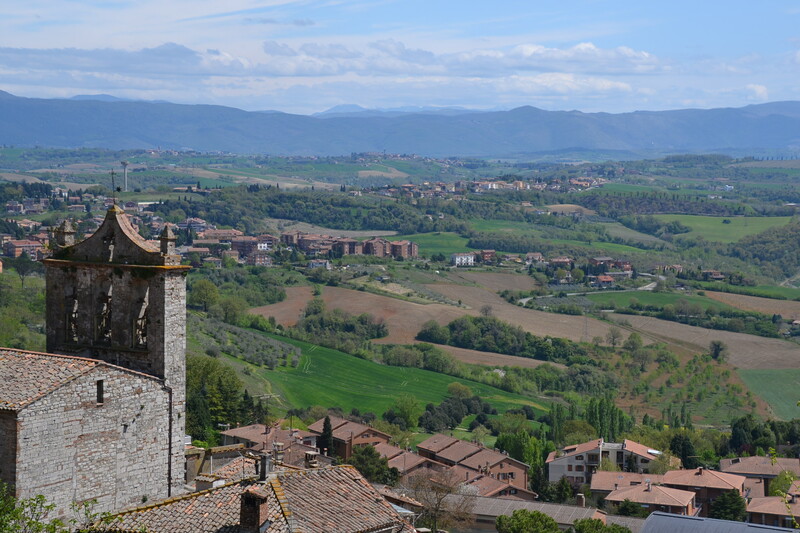 The Aire we parked in is just outside the wall of the medieval town of Montefalco next to a vinyard looking out over the valley. When we arrived it was free AND it had electricity… a first for Italy, however by the time we left – it was only four nights before you ask – they had installed a meter charging 5 euros for 24 hours. On Monday, after a rather hilly and disjointed morning run as I hadn’t a clue where I was going, we set off to have a look around the town. 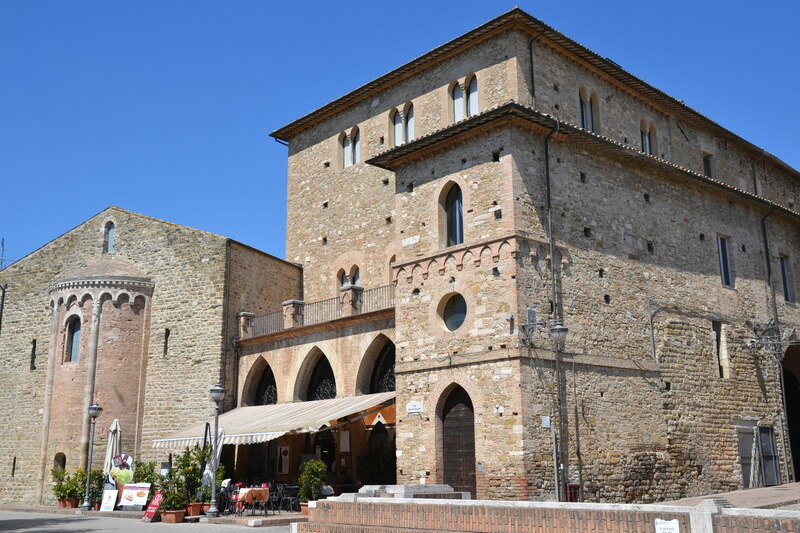 Montefalco is fairly small with all of its narrow cobbled streets leading up (literally) to the main square…. or circle to be precise. It is strategically placed on top of a hill with the main plaza on the ‘hump’ and the rest of the town skirting around it, taking in the views of the valleys below on each side and the mountains beyond. This area of Umbria also produces beer, not just ‘lager’, but beer similar to that which we brits like to drink…. less bubbles and a bit warm J So, next time an Italian mocks you about drinking warm beer, feel free to highlight that Umbria makes their own fair share of it and it seems to be fairly popular…. Needless to say that we haven’t managed to try any yet as the place we wanted to visit was shut…. So on Tuesday morning we cycled (free-wheeled most of the way actually) down to Bevagna which is roughly 10km from Montefalco, parked up the bikes and had a walk around. Bevagna is slightly off of the beaten track so doesn’t have as much through traffic but sitting on a river it is equally as pretty and worth stopping off if passing through. After a good walk around we got back on the bikes and continued on to Spello roughly 10km further climbing up the foot of the mountain. Spello has a huge amount of character, even more so than some of the other medieval towns we have visited recently, with tiny roads and alleyways climbing steeply up the hill, lined with buildings once again maintained to that ‘shabby chic’ level rather than being manicured, looking like an assorted chocolate box – all different shapes and sizes, lived in by normal people….. just not one to visit if you have a push chair or wheel chair I am afraid. On Wednesday, despite a little bit of saddle sore we got back on the bikes and headed to Spoleto ….. the last medieval village/town that we plan to visit in Tuscany and Umbria. 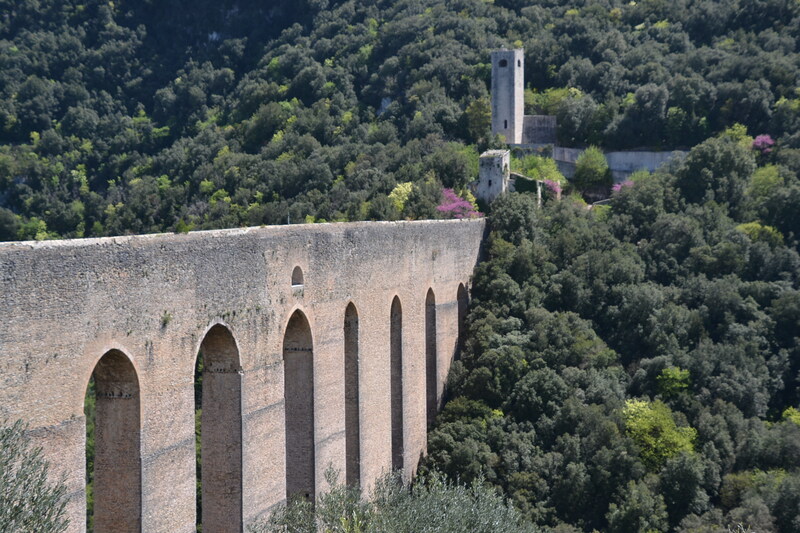 Spoleto is one of the larger medieval towns we have visited with a fort/prison at the top of a steep hill with a pathway circling all the way round it, providing views out over the bridge and valley below…. not too bad a spot to eat our lunch…. The cathedral in Spoleto was also pretty impressive but as a whole, now we have seen a fair few medieval towns in Italy I think Spello is my favourite, although as Keith says, Montefalco has a good balance and was the best placed for us as it enabled us to get to other places on the bikes…… I think we can happily say that we have ‘done’ our fair share of medieval towns now – and just in case you were wondering, Spoleto was a 50km round trip with an 800m climb …. A good bit of leg work ! 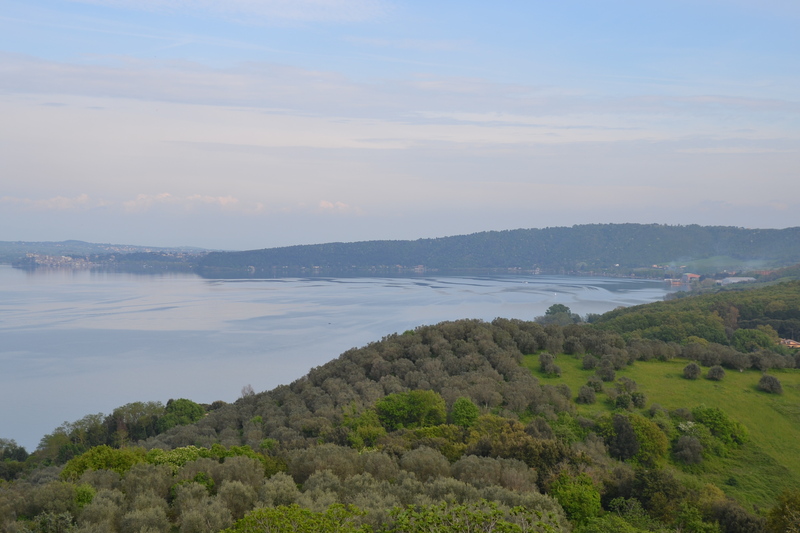 So, on Thursday we moved on, travelling all the way to a town called Bracciano which sits on lake Bracciano – a long way for us! We chose to stop at Aire ‘Le Mimose’ (14 euros per 24 hours) although there are several campsites here as well probably due to the proximity to Rome. The Aire is over looked by the castle (apparently it is where Tom Cruise got married), 200m from the lake and 500m (200m of which are up) from the town itself. The town is a bit rough around the edges and feels a bit commuter-like without much soul, but I guess part of that is because we are only 30-ish km outside Rome, the lake however is clear as clear can be and beautifully tranquil – thankfully we are staying closer to the lake! The lake is 35km all the way round and despite it being a really foggy morning, we thought we would pack our sarnies and have a cycle round to see what the other villages/towns were like. It is a nice ride as although it is a national holiday there still wasn’t a huge amount of traffic on the road and the route is reasonably flat. 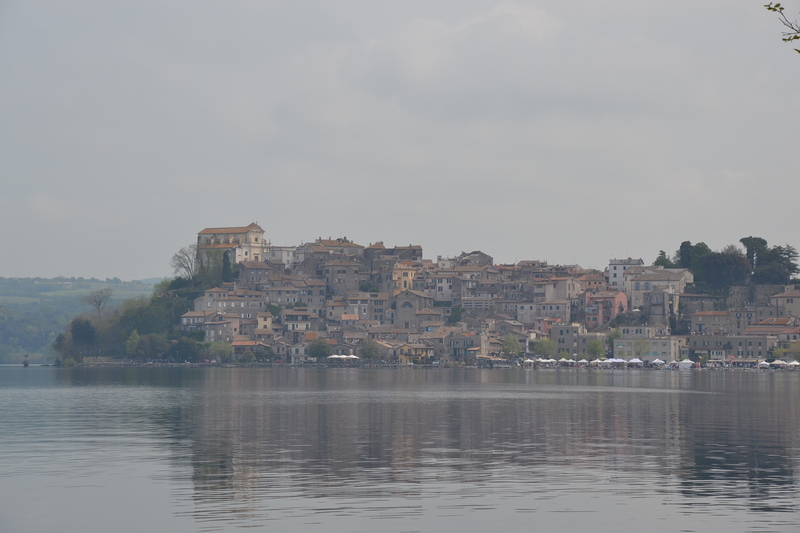 The route only passes through two other towns – Anguillara Sabazia, which had a market where we stopped to have a look around and Trevignano where we ate our lunch which was much more tranquil and more ‘holiday’ like. A pleasant ride on what turned out to be a warm day as the fog cleared. I have decided that the Italians are either insecure, or searching for an Arc as when they travel in Motorhomes they appear to only ever be in pairs, or possibly more, we first saw this in France last year … but it appears to be the case within their own country as well not only when they venture further afield. I figured that as Keith and I are eating enough of it we should really find out a bit more about the history of ice-cream and why Italian Ice-Cream is sooooo good. And I have made a faux pas, I assumed that Gelato is Ice-Cream, where in fact there is a subtle difference…. Apparently using low fat milk rather than cream makes the all important difference to the texture and flavour – the lower the fat content, the more the flavours are pronounced. The other key difference is that Gelato is more dense than Ice-cream as it has less air whipped into it, although oddly Gelato should apparently be consumed whilst it is softer whilst Ice Cream should be firmer. All pretty interesting, but it still doesn’t explain why there is so much ‘Gelato’ over here rather than in the UK…. Or perhaps it is just the weather? With a bit more digging I found that Italy didn’t actually ‘invent’ Ice-Cream (or Gelato) as such, it was China, although it was much more like a granita/sorbet using rock salt to help solidify the mixture rather than any milk or cream. From what I have read, it is understood that Sorbet, Granita and Italian Ice were introduced to Italy by the Arabs who used mountain snow and fruit juices to make ‘Sharbat’ which is where Sorbet originates from. Italy apparently then evolved the dessert, introducing milk to become Gelato and it wasn’t actually until the 1800’s when the Gelato ‘boom’ hit and it became very popular to experiment, creating different flavours and types of Gelato based desserts. Back to the travelling then…… it has been a busy week as a) we have moved a fair bit and b) I had intended to update the blog earlier than now but we didn’t have coverage to connect to the internet. We moved on from Lake Trasimeno and back into the Tuscany hills and vinyards, stopping at a place that we had selected from our ‘Fattore Amico’ book just outside Montepulciano. 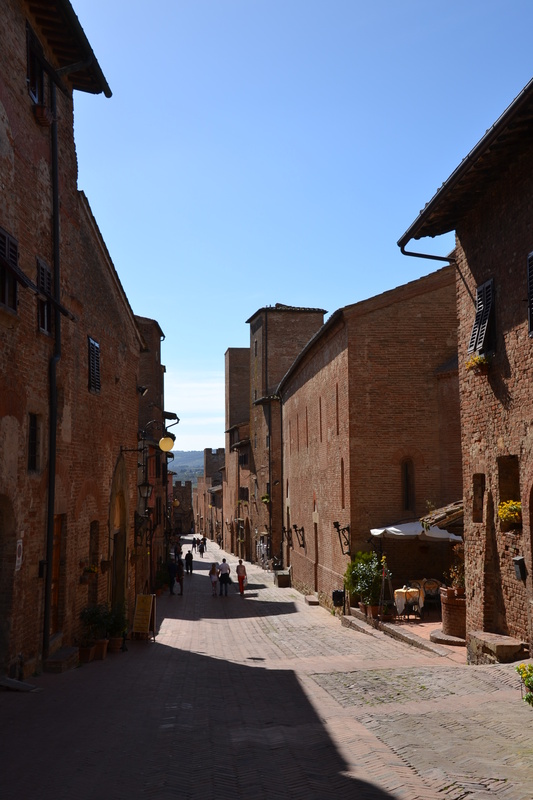 Montepulciano is a yet another ‘quaint’ medieval hilltop walled town surrounded by vinyards and olive groves. From my minimal Italian wine knowledge I understand that Montepulciano and Montalcino (where we went the following day) are the equivelant of the St Emillion wine in France where there is restricted land and therefore the price is high. 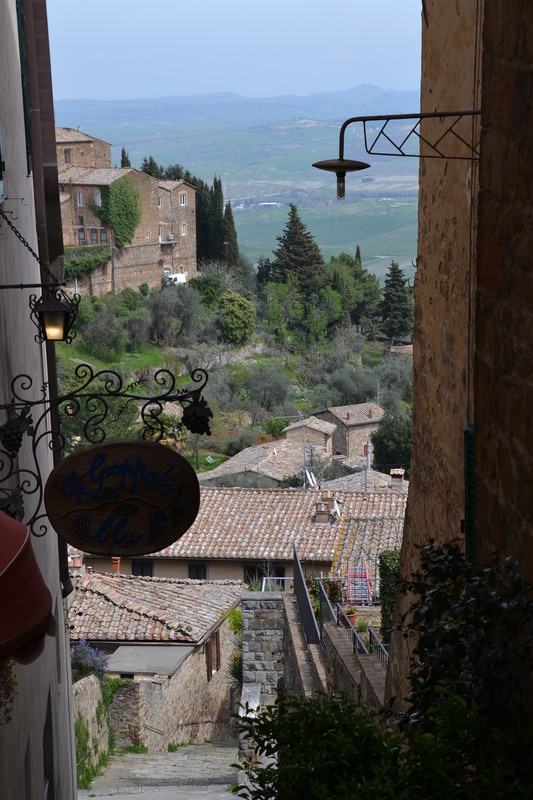 Although the Chianti region is stunning, both Montepulciano and Montalcino have the hill top medieval towns that provide the extra ‘pull’ to attract the tourists … from what we have tasted, I am not convinced that the wine is any better. 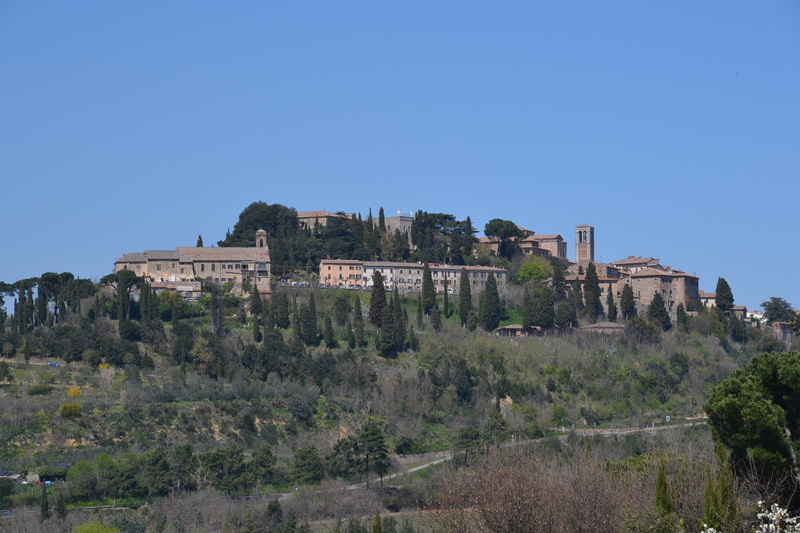 The place we stayed at was called ‘Fattoria Pulcino’ which used to be a monestary but following a change in where the borders between Umbria and Tuscany fell, many Monks left the region leaving the Monastries behind them, thus enabling the current family to buy it in 1965. The current owners have evolved the place into one of Montepulciano’s larger wine producers whilst also producing olive oil, home made desserts and jams in addition to having a restaurant where they have an original wood burning stove for cooking. We took the opportunity to try the ‘Fiorentina’ Steak which is famous throughout Tuscany and although it was one of the more expensive meals we have had in the last few months (the porterhouse steak was 56 euros a kg), the meat was cooked perfectly and delicious with it. The Anti-Pasti and accompanying (home grown) wine weren’t bad either however, although we enjoyed the meal we both agreed that we wouldn’t go back there to eat simply because for us, part of the food is the experience of being in someones home/farm rather than a fully established restaurant. So, after saying our thank you’s in the morning we headed on to Montalcino with the intention of staying at a vinyard however, we changed our minds when we saw the prices of the wine. Montalcino is evidently even more of a niche market than Montepulciano and the vinyard we stopped up was very classy… a step above what we are used to, so despite them being incredibly welcoming and friendly, we decided to go and stay at the Aire just above the town. The Aire (5 euros for 24 hours) was 700m from the wall to the town, 200m of which were upwards – unsurprisingly it was however incredibly peaceful with only birdsong for company! Montalcino is very pretty and felt less touristy than Montepulciano, perhaps because it was smaller, or possibly just because of the time/day we arrived. We had a nice wander through the town and we even managed to try a few local wines but weren’t bowled over … perhaps they are just to someone elses’ taste, we did however find a very good butcher where we bought some sausages and chorizo …so nothing lost! Each of the hill towns is unique and has its own personality, Orvieto is perched at 600m+ with vertical sandstone cliffs falling away from it (not literally as obviously that would bring a quick end to the town itself, but a very sharp fall off). As expected, we walked up rather than getting the funicular and were well in need of some cooling down when we got up there. Thankfully we passed an interesting looking chocolate shop which made its own chocolate based gelato …. Interesting, very rich, but not the best we have had. 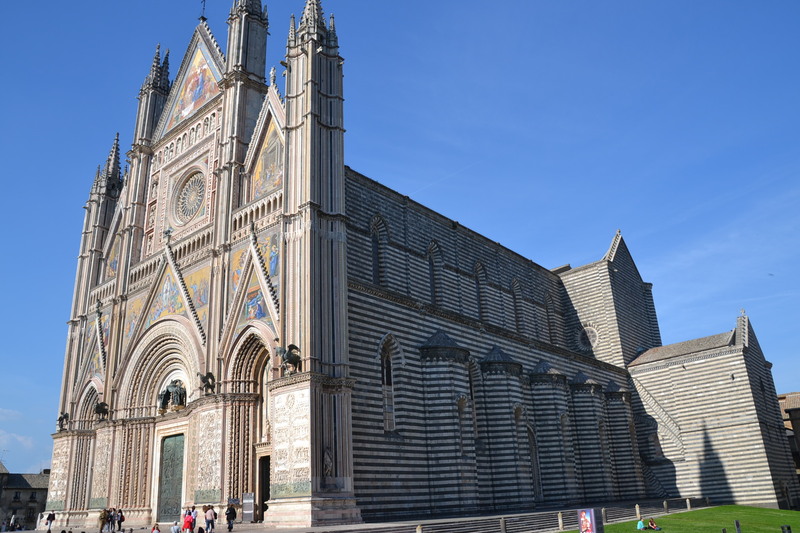 Gelato aside, the town itself has the most beautiful views out over the Tuscany countryside and boasts some quite impressive buildings including the main cathedral. Bolsena is a pretty little medieval town with a castle looking out over the lake and unsurprisingly there are a handful of nice looking hotels, restaurants and bars on the lake front itself …. All quite relaxing and tranquil, although I am sure that come the summer it will be a different story! Despite the weather having been in the high teens/low twenties for the last few days, it rained on Thursday night bringing the temperature down and introducing grey cloud on Friday morning. We decided however to brave the cloud and set off round the lake on the bikes, stopping for lunch at Montefiascone which we should have guessed by the name was a bit of a climb….400m to be precise. Unfortunately we decided to turn back after Montefiascone rather than continuing as we were cycling on the main road which was fairly busy, it was raining a little and the part we had done wasn’t as pretty as we had hoped. A good excuse to get back early so Keith could make Quiche with enough time to let it cool for dinner. Up until recently we had been eating out roughly once every couple of weeks but appear to be on a run of spoiling ourselves a little more frequently. Keith found another Fattore Amico place which looked a little more rural and very authentic that he wanted to try. So we packed up and headed to Castel Bagnolo, a biological farm just outside Orte. On the way we stopped in Verterbo -all I can say is that I wouldn’t go out of your way to visit. The medieval quarter was really quite exceptional but as I had read, it was small as much had been destroyed in the war and unfortunately the rest was a bit average unfortunately. Our journey continued to Castel Bagnolo for which the last 5.5km was up (literally) a dirt track – well part was road but to be honest the dirt track was in better condition. 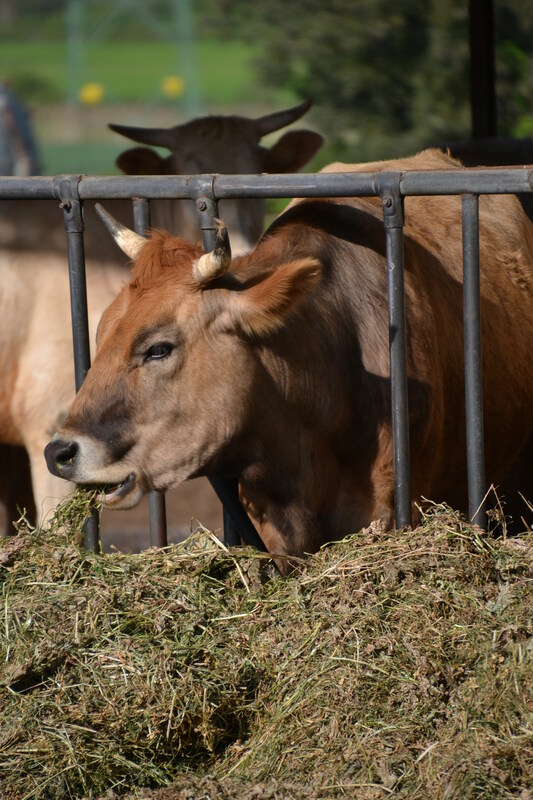 When we arrived we were welcomed with open arms and pointed in the direction of the pigs, cows and hens to have a walk and relax ahead of dinner. Returning in the evening we were drawn into the dining room by an open fire burning, in front of which was a table set for two where we enjoyed a hearty farm reared menu including – Anti Pasti of home reared and cured ham and sausage along with home made bread and savoury muffin, primer platti of pasta with tomato and panccetta sauce, segunda platti of steak and sausage cooked on the fire in front of us with salad and artichokes, desert of millefeuille with strawberry and fresh cream all washed down with a local red wine and followed by an expresso, Grappa and home made walnut liquor. The walnut liquor wasn’t actually made from walnuts, or the shell, but instead from the exterior green casing that as far as I am aware we normally discard …. It was rather pleasant though, far more palatable than the grappa but I guess that isn’t saying much! After saying our thank you’s we moved on this morning planning to stop in Todi tonight, but when we arrived the Aire was another of those that are from 7am until mid-night and really pricey with it. We parked up anyway and after a good look round the town which is yet another very pretty (one of the even nicer one’s) walled medieval town, we decided to do the journey we were going to do in the morning over to Montefalco and hopefully stop for a few nights. Having been parked up opposite a warehouse for the last three days where there was a constant stream of people going in, then coming out 5 minutes later with different sized brown bags, we felt we had to venture in ourselves to see whether it was actually a bakery, or the local drug dealer for the Chianti region…. As luck would have it (for us at least …) it was a bakery and we got to try our first Italian ‘ciabatta’. Jaws aching after the additional chewing required for the ciabatta, we headed to Arezzo where we parked just outside the historic center in a large, tranquil car park with lots of other motorhomes for free. After a bit of food shopping and roll baking we headed out to find somewhere to eat as we feel obliged to continue the quest to try a few more Italian Pizzas to see if the quality remains at the same level. We had found a little place on our way back from the supermarket which said it did Pizza on the signage outside and although we tried to get a menu earlier and all we grasped was that last night had been a big one and he wasn’t going to stay open too late tonight, it looked authentic so we headed back. We were welcomed by the chef/owner and sat down with a carafe of wine whilst the chef started to real off tonights options…… tripe (I recognised this one as it is ‘Tripa’), Taggliatelle, and several other things that we couldn’t make out but when asked what they were, he explained ‘Intestines’. Now, for those of you who know me, you will know I eat pretty much anything (Keith eats anything…literally), but I don’t touch intestines or offal. Needless to say, I think he may have been a little offended when we apologised profusely explaining that we had hoped for a pizza. If we weren’t in Italy, I myself would have thought that we lacked culinary diversity – but I still wasn’t going to eat intestines or stomach lining for anyone – and I can make pasta at home. So, heads hanging low as we left the restaurant (which was empty by the way) we continued our search for a Pizza restaurant and eventually (we walked the wrong direction) we were contentedly filled with a bit more authentic Italian Pizza…. We headed into the town itself on Thursday and Arezzo was lovely. 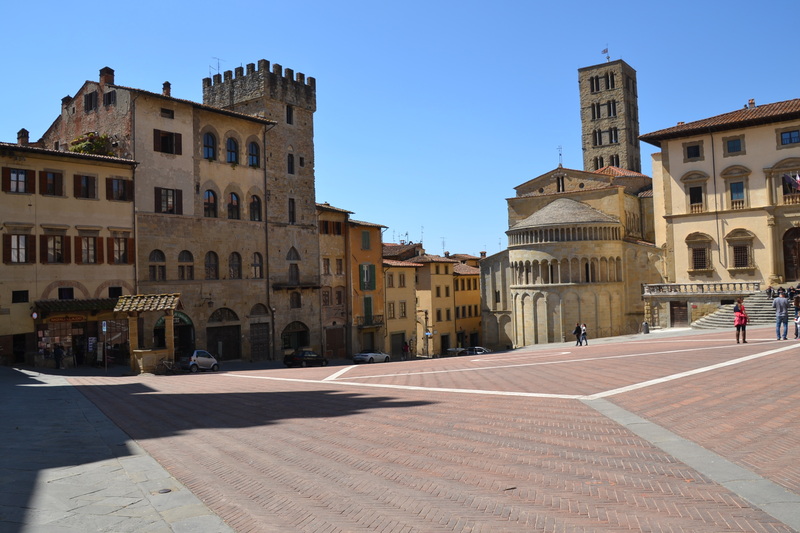 Whereas most of the other walled towns/villages we have been to in Italy have been flat, the historic part of Arezzo is built on a hill which adds a bit more character. 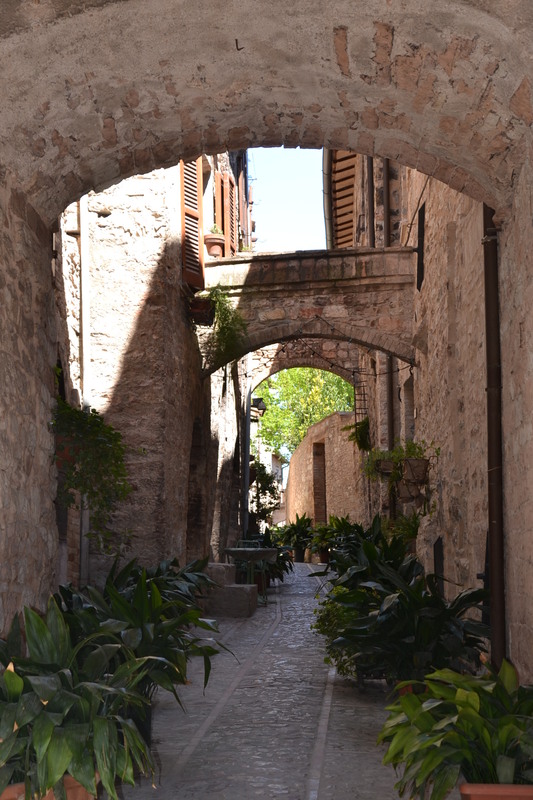 At the top of the hill and on one edge of the wall was the old fort with beautiful gardens surrounding it, then the narrow cobbled streets led down towards the newer town which sat at the bottom of the hill outside the wall. A real town, which although a large part of it was destroyed during the second world war, continues to maintain the remainder of its beautiful old buildings to a high level including the rather unusual sandstone churches and towers. Arezzo has a lovely feeling to it – possibly a bit of a buzz as it is a university town, nothing could have put more of a smile on our face however than when we turned the corner taking in the incredible architecture of the old library and the Maria Santa Tower (stunning building made up of pillars) as an orchestra started to play the soundtrack to Star Wars …. definitely worth a visit if you are nearby. Full of fuel, LPG and food we meandered our way to Lake Trasimeno where we found a very tranquil Aire by the side of the lake (12 euros inc elec.) in Castiglione del Lago. The weather has warmed up a bit in the last few days and over the weekend it has risen to roughly 21 degrees during the day and 9 overnight … quite spring like 🙂 Despite the warmth there has been a mist over the lake so although it is beautiful, photos are poor. Yesterday we had a wander around the lake and then up into the old walled town which sits up on a hill looking over the lake taking in a local truffel cake along the way, then today cycled part way round the lake to the other main town, Passignano sul Trasimeno. Despite having to go on the roads as the paths were flooded it was a really pleasant ride, adding another 51.5km to our total….I wasn’t going to say anything about me falling off my bike on the way back whilst being distracted by an ice-cream shop, but Keith insisted. I am in need of seeking some help to get over my Ice-Cream addiction….. In change from last week when we had a few days of city hopping we have been exploring some of the Tuscan hill villages which has been beautiful. We wandered into Certado which is a small, but beautiful medieval walled village on top of a hill looking out onto the Tuscan hills. And then later in the evening went in to the farmhouse to eat on the long table in front of the fire with an Italian and Bulgarian/Swiss family who were staying in the guest house. Dinner was plentiful to say the least with a bottle of white wine, red Chianti Classico in addition to a bottle of their special Chianti on the table for each family to accompany home grown anti-pasti of salami, ham and bruschetta with olive oil, First plate consisting of home-made Gnocchi with Turnip flowers and sausage, Second plate of Lasagne, third plate which was beef cooked in wine with salad on the side, dessert of a warm strawberry tart and coffee and grappa. It was home cooking, but it was delicious and we were made to feel part of the family…. Definitely worth the 25 euros. We went back in the morning to pay and were offered coffee and cake whilst learning more about the family and the Italian economy and found out that the ‘special chianti’ is 15 euros a bottle and most of the 70,000 bottles they produce each year are exported to the states…… it was rather nice though! Moving on we wiggled our way through the beautiful countryside to San Gimignano which is another slightly larger (and much more touristy) medieval hill village. Most of the photos within the village itself had far too many people in them but thankfully looking out was even more spectacular. 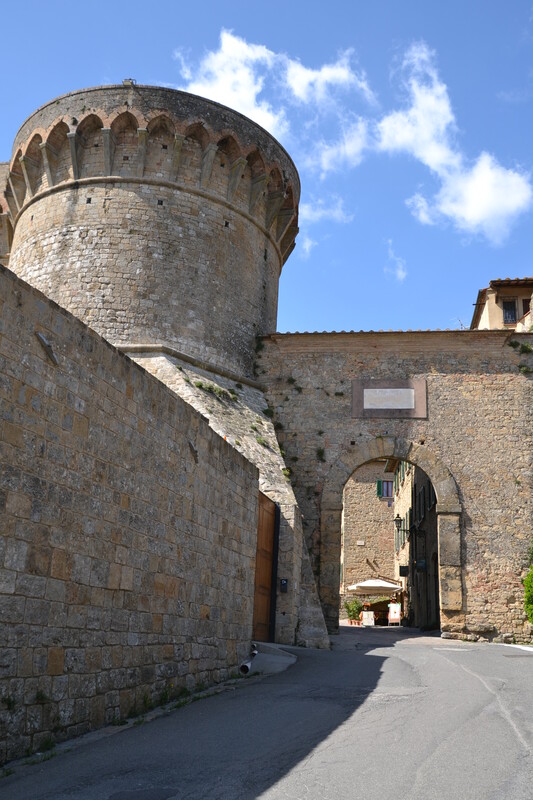 Moving on from San Gimiginano we wiggled a little more through the beautiful Tuscany countryside to arrive at Volterra … another walled hill village which oddly housed a fairly large prison. We stopped at the aire (8 euros from 8am – 8pm) as we had intended to stay, and headed up the steps into the town to have a look around. Volterra is less touristy than San Gimiginano but equally as pretty and the prison itself was a beautiful building although you weren’t supposed to take photos…. We had planned to stay a couple of nights, but to be honest were a bit put off by having to get up and be out of the place by 8am, so as we had seen what we came to see we emptied and re-filled and decided to move on to Siena where we parked up at the Stadium roughly 3km from the center. By the time we arrived back at the motorhome the waterproofs had done their work, but they had been pushed to the limit and were soaked … everything takes slightly longer to dry out in a motorhome but with the heating on and mushroom and spinach risotto cooking, we settled in for the night. 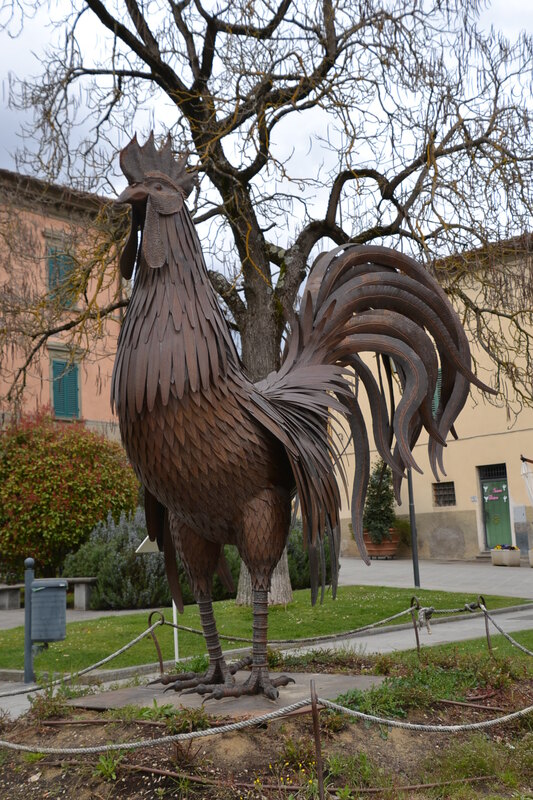 With grey skies above and the church bells ringing to bring in Easter Sunday we did our morning routine and headed towards Gaiole in Chianti which is apparently the main market town for the Chianti wine region. Oddly we chose it as it was a little smaller and less known than some of the other towns, but after a short 15km of twisting roads we arrived and the Aire and couldn’t have picked better. After a short walk through the town we found some maps for some local walks and decided to head into the hills to try one out. The skies were blue but there was a chill in the air and although the clouds were closing in quickly we decided that there was enough daylight to complete the short-ish walk…. The route we had opted for was only 9.5km (albeit containing rather a lot of hills), but it passed through some of the most beautiful Tuscany countryside. As is always the way, the signposting lacked the level of detail when it was necessary…. So where we should have turned right just before the main road we ended up doing an extra 5km on the road…. He ho… we enjoyed the walk, but there were a couple of points that I questioned starting out at 3pm ….. all good though as we still arrived before it got dark! Despite the bad signage yesterday we decided to stick with it as the sun was shining (although it was 5 degrees inside the motorhome), and go for another walk into the hills. As I hadn’t mentioned it before, Gaiole in Chianto is in a valley – so, no matter which direction you go, you go up. On Monday we walked a northern circuit and yesterday we walked an Eastern circuit, slightly longer (than the original planned route on Monday at least) taking in some spectacular views of the snow topped mountains in the distance … definitely clearer skies. As we like to put something back into the local community – even more so when we are staying on free Aires – we had planned to go out to eat on Monday evening, but arriving back from our walk we couldn’t find somewhere that we fancied so instead decided to try out a couple of local Chianti’s in the bars – all quite nice ahead of settling in to a good Chilli in the motorhome. We decided to stay another night to walk the southern circuit, but were conscious that the forecast was for a bit of rain mid-morning, so weren’t in a hurry to head off. Just about 10am the wind got up, the clouds closed in upon us and it started to rain, then suddenly it looked like the wind had stripped a very large tree of its blossom – instead however it was snow, continuing for 3 or 4 minutes and then it disappeared with the clouds as quickly as it had appeared …. Quite odd. The southern circuit which was supposed to be 12km ended up being the South Eastern circuit of 17.5km …. Apparently we missed a blue dot somewhere….. I haven’t updated the distances for a while and due to the hop through France we are slacking a little with our walking/cycling…..
Can you believe that we left the UK on March 27th 2014 …. which means we have been away for more than a year now, although only 7.5 months in the motorhome. I am sure you will pleased to hear that we are still keeping up with the slightly odd ‘Keith and Gail-isms’ including baking our own fresh rolls, homemade Brownies and muesli as well as occasionally making American pancakes for breakfast, we have also continued with our daily exercise routine either running or Tabata….. and amazingly we are still talking to each other. We are now completely settled into true Italian life and are quite enjoying it, I think I have even used the horn on the motorhome for the first time – see what the Italian passion does to you! 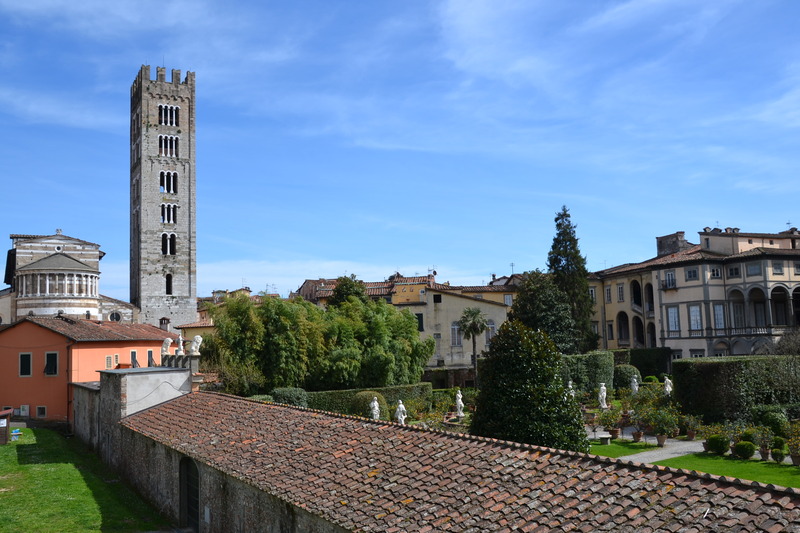 We have moved on from the Italian Riviera, finding ourselves last weekend in Lucca which is an ancient medieval city with a beautiful (and intact) wall surrounding it. For those of you into your music it is also the birthplace of a number of composers including Giacomo Puccini (Madame Butterfly…. I am sure even the less musical of you have heard of that one!) The city is made up of cobbled streets and plazas lined with beautiful old buildings including a disproportionate number of towers – all however full of character. The city had a lovely ‘buzz’ about the place and although there were a fair few, it didn’t feel full of tourists, or too busy and in fact it was very tranquil overnight. Obviously not being one to miss out on a good ice-cream, on Sunday afternoon after a bit more exploring of Lucca we headed back to our ‘local’ and decided we have found a bit of a gem … the ice-cream marker point has definitely been raised. Although Keith was keen to stay a bit longer and go back to the Pizzeria to try the Foccacia Pizza, we figured that a) there is plenty more pizza to be had in Italy and b) if we continued our Pizza and Ice Cream consumption at this rate we may push Mika over her weight limit, so we moved on on Monday. 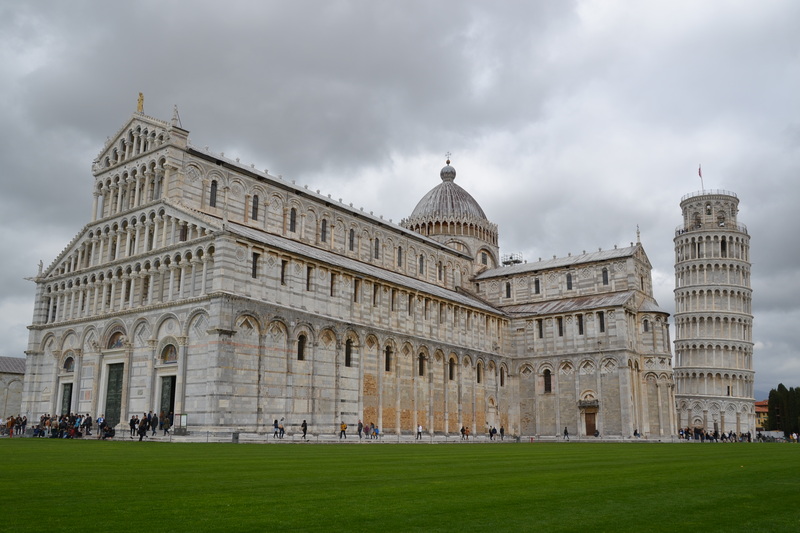 The plan – as much as there ever is a plan – was to stop in Pisa for one or two nights however, we arrived at the Aire ‘Parcheggio Camper’ just after lunch and after a couple of hours walking we had pretty much seen everything …. well the tower, the cathedral and lots of road works, so decided to head on to somewhere a bit quieter for the night. Our overnight stop wasn’t too far up the road in Montopoli in Val D’Arno and it was a free Aire with services where there were 20 odd Italian motorhomes but over the 20 odd hours we were there we only saw two people…. So, all a bit odd especially considering that rather sadly, Montopoli in Val D’Arno is a medieval village/town which obviously used to be thriving, but has now been left with lots of empty shops and looks a little unloved and grey. So, although we planned to stay a couple of nights we decided to move on to Florence after a quick visit to the Laundrette. We thought we would try our luck with a free Aire on the outskirts of Florence in Sesto Fiorentina, however we lucked out as the Lidl it was in front of had closed and the services had been removed. The lack of services probably worked in our favour as we ended up in Gelsomino SCAF Aire (15 euros per night) which was 2kms from ‘Puerta Romana’, so fairly central to Florence. We wandered into Florence yesterday afternoon to stretch the legs and have a quick look around and it was buzzing – we have never seen so many ice-cream shops. 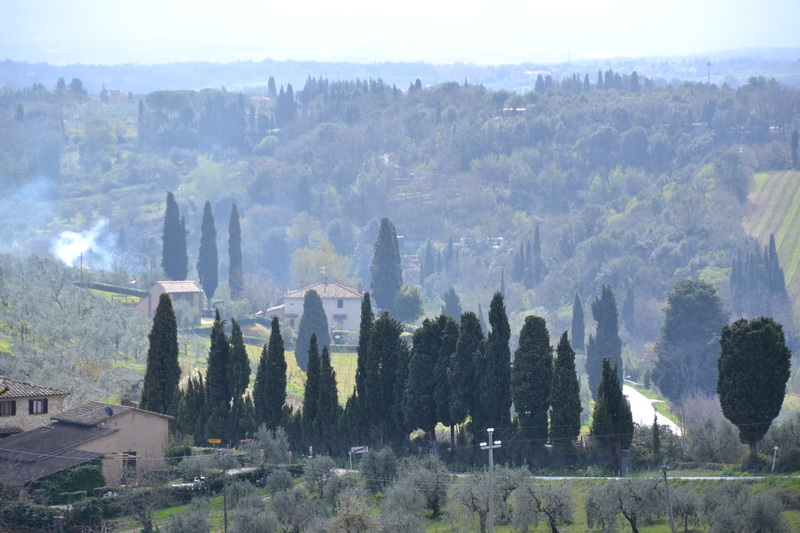 Then today after a run round the edge of Florence looking down from the hills – me and Keith’s 100 burpee monthly challenge, we headed back into town to take in the markets and the rest…. 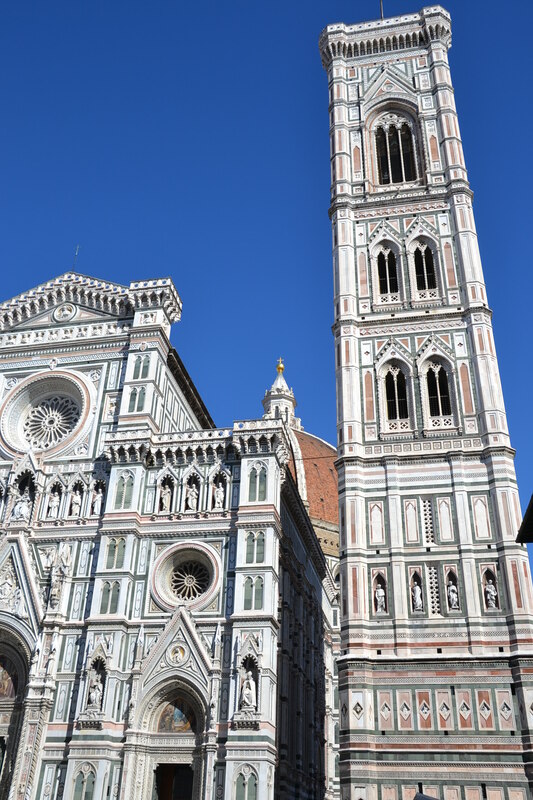 The architecture is beautiful varying through the centuries whilst using different materials – several of the churches and the cathedral built in white, green and red marble, other buildings with old timber beams and of course stone and brick from different periods. The different coloured marble really stood out making the cathedral one of the more unusual, and attractive buildings we have seen.